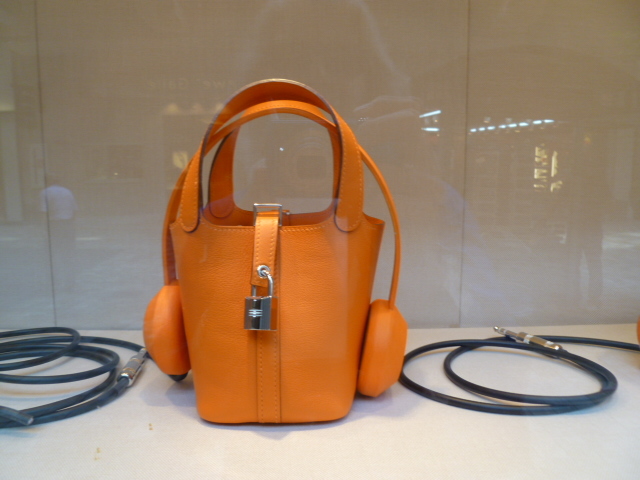 The Hermes windows have a musical theme. Last week I went shopping with Kyle Kagamida, one of my Fashion Forum members and an up-and-coming stylist. I wanted a new look and thought it would be helpful – and fun – to see what Kyle would choose if he was styling me with an everyday look. I have not been shopping since I lost my job with The Honolulu Advertiser so I was definitely ready for some retail therapy. We had such a great time! We simply could not break away entirely from the black-and-white palette, especially when we shopped in White House Black Market. I have always been a classic black-and-white girl, partly because the contrast works so well with blue eyes, fair skin and gray hair (and I have had gray hair since my twenties, when I decided that, no, I was never going to color it). We did veer more toward white than black, though, finding a great striped white top and white jacket which seems to go with nearly everything in my closet. Kyle has an erudite eye and it was fun to watch him pulling evening gowns for his weekend shoot in between our shopping. He pulled the most amazing royal blue Armani gown – I can’t wait to see the photos! Speaking of blue, I am still lusting after a pair of periwinkle platforms that I might just have to go back and buy…. Anyway, while we were shopping around Ala Moana Center I happened past Hermes. WOW! I was stopped in my tracks by the utterly charming, festive and eye-catching windows in Hermes Ala Moana. 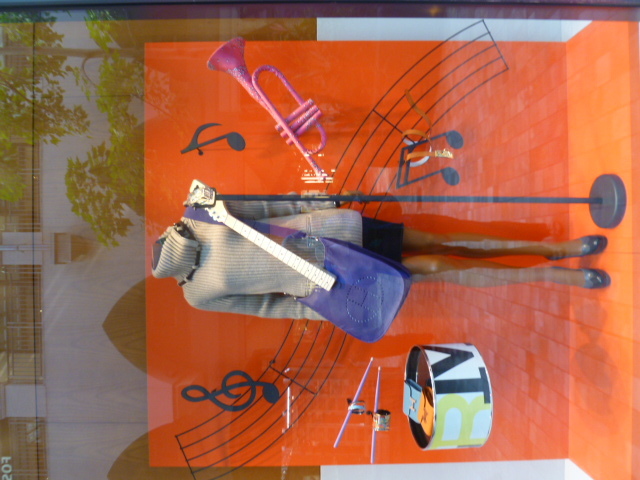 This brilliant stroke of visual merchandising with a musical theme takes Hermes clothing and accessories and pulls it together into a memorable and magnetic set of windows. A whimiscal way to display watches at Hermes. Be sure to stop by and spend a few moments appreciating this fabulous visual merchandising. 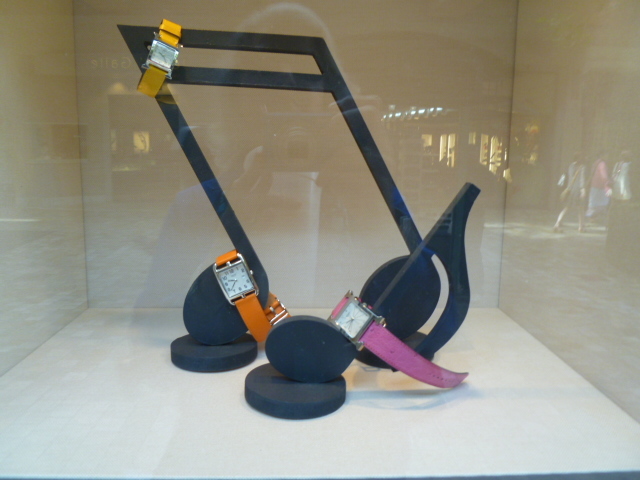 A complete Hermes musical window. This entry was posted in Design, Environmental Design, Hawaii Fashion, Shopping, Uncategorized and tagged Ala Moana Center, Hermes, Kyle Kagamida, White House Black Market Ala Moana. Bookmark the permalink.